So many of our memories are forever entangled with the aromas and tastes of special dishes and special meals. We call them comfort foods but we all know that it’s not the food itself that comforts, but rather the memories that are triggered when the kitchen fills with the scent of baking bread, simmering spaghetti sauce, bubbling casseroles, fried chicken, sizzling bacon, or pancakes on the griddle. We each have different comfort foods but they all have one thing in common. Comfort foods trigger memories of times when we felt safe and warm, when loved ones were near, when laughter came easily. These are the foods we turn to when the world feels just a bit uncertain, when we need reassurance that yes, tomorrow will be a better day. Sometimes it’s a huge meal we crave, sometimes all it takes is a side of gravy. And sometimes, all of life’s worries can be pushed aside with something as simple as a grilled cheese sandwich. What are your comfort foods? 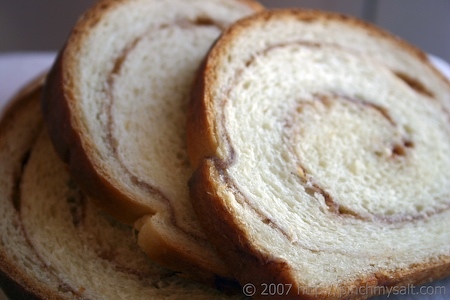 Do you have a favorite family food memory? Barbara from A Writer Afoot has shared some of her memories in a beautiful post titled Of Biscuits and Sunday Mornings. She has invited us to visit her site and share some of our own family memories that revolve around food. I’ll have to think about what to share, but I plan on writing something soon. Join me? Very bizarre, but the first one that came ot mind was my mother's liver, bacon and onions! I should be worried I think. All of your photos look very comforting... Must give this some thought! Mmmmm! My Grandmas rolls that she would make everytime she visited. I still make them today. 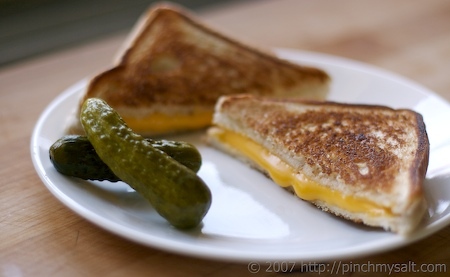 I think you captured it for me with your photo of pickles and a grilled cheese sandwich--the ultimate comfort plate! My other favorite comfort foods of choice are refried beans wrapped in a fresh flour tortilla, my grandpa's pancakes, my grandma's chocolate pie and my mom's garlic mashed potatoes. 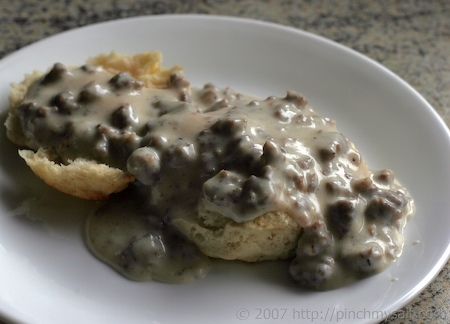 Now I'm really craving biscuits and gravy! Yum. I was just mentioning to somebody the cheese souffles my mom used to make for me after school! I don't know if I can post links, but there's an interesting article on gender differences in comfort foods here: http://www.eurekalert.org/pub_releases/2003-07/uoia-gpi070203.phpI think comfort foods stem mostly from childhood; most have so far commented on their mother or grandmother making something, and memories are mentioned in the post. Comfort foods take us back to a safe place as a child, when we felt cared for.For me, it's chicken and homemade egg noodles on top of mashed potatoes. Yeah, very starchy, but the only way to eat chicken & noodles! I wrote about some more of mine a while ago on my blog, but I also think holidays are wrapped in comfort foods; that's why we make the same things year after year for Thanksgiving and Christmas meals. Good ole' Mac n' Cheese, meatloaf, Beef Barley soup, roast chicken, avgolemeno soup, spanokopita....lots! Baked Ziti. Only my mother, sister, and cousin, and aunt can make it. If anybody else makes tries, its not worth eating. peanut butter and jelly sandwiches, mac and cheese, grilled cheese sands w/tomato soup, chocolate chip cookies and milk, tuna salad and egg sandwiches, fried eggs over rice...those are just a few of my comfort foods. btw, wonderful photos (espec. the grilled cheese shot!). Love the shot of grilled cheese . . . definitely a comfort food. Although, honestly, it's the ketchup that I dip it in that gives me the most comfort (I'm a ketchup addict). Hmmm . . . good topic to ponder as autumn sets in. I'll get back with more thoughts . . .
Makes tries? How about "tries to make it?" My very favorite comfort food was Campbell's Scotch Broth soup! I absolutely loved that soup and it always comforted my soul. Unfortunately, they no longer make it the same as they used to, but the MEMORY lingers on. Yum! A great post and interesting question, Nicole. In your amazing previous post on biscuits, I named biscuits and gravy as a breakfast comfort food. Another odd one for me used to be Nabisco Ginger Snaps dipped in cold milk almost to the point of disintegration. In fact, at least one would lose its structural integrity, much of it plopping back into the glass, when I ate them. Unfortunately, as with Leslie's Campbell's Scotch Broth Soup, the recipe seems to have changed. They still taste pretty much the same, but they don't soak up milk in that same satisfyingly dangerous way. Great post! The grilled cheese photo takes my memory back to our younger years and our late night visits to Denny's or IHOP at 2am. You ordered a grilled cheese and dipped it in ketchup. 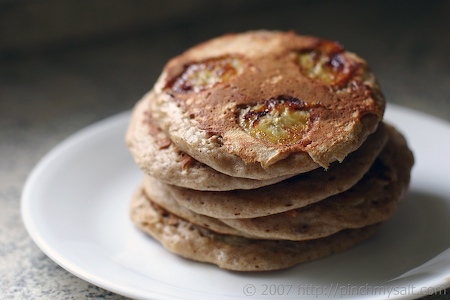 The banana pancakes remind me of Central Camp and waking up to the aroma of your Dad making them for us. Going even further back and having come from a Mexican family, my fondest comfort foods are the sound of a wooden roller pin pounding away while smelling the lovely aroma of fresh tortillas bubbling on the stove. Also the faint scent of pinto beans brewing on the stove (we had beans with every meal, breakfast lunch and dinner!) Fun post! The smell of bread baking always gets me, I think that's the biggest one, warm bread out of the oven, slathered with butter. My Mums chicken soup pops straight into my head when I think of comfort food! Macaroni cheese. No contest. Most of my comfort foods seem to involve cheese - toasted cheese sandwich, simple pasta with cheese and butter, grilled halloumi ... problem is, I'm trying to stick to being non-dairy. Oooh, comfort food. My favorites are my mother's baked split pea soup, egg custard and meat loaf. When I would come home from boarding school she would have all three waiting for me. And later on, when I visited, they would all be on the menu at some time. It has turned cold here in Northern California so the thought of comfort food is, well, comforting! Yum! I think you named most of my favorites. Definitely mashed potatoes and spaghetti. Reading about all these different foods is making me hungry!! Keep them coming!Susan: I'm intrigued by the baked split pea soup...do you have your mother's recipe? My grandmother's macaroni and cheese...very milky, almost like soup. With sharp cheddar crust and liberal amounts of black pepper. She's gone now and there's not a one of us in the family who can come close to re-creating that dish, even if we watched her do it a million times. Nicole: No, I don't have a recipe for baked split pea soup. My mother probably got it from her mother who got it from her mother . . . etc. What I remember is she put all this stuff in a big pot ~ dried peas, ham hock, onions, garlic, s & p, herbs, water, stuck it in the oven and several hours later it was soup. Here's a research project for you! Tamale pie, lemon cake and my mom's beef stew! yum! Oh an Potato Leek Soup. My mother's waffles. Definitely, without a doubt! Fantastic post!I think some of my favorite comfort foods are really gooey grilled cheese sandwiches -- though the Croque Monsieurs I used to get when I lived in France might actually beat out the grilled cheese my mother used to make...My grandfather's both made foods I consider comfort foods: My Dad's father made pancakes with real Maple syrup when we'd all be up at the family cottage together. Those were the best pancakes I've ever eaten...And my Mother's father used to make popovers once or twice a year on special occasions, like Christmas Eve. Those popovers were outstanding and I keep trying to reproduce the feeling they brought me, every time I make popovers... Of course, I don't serve my popovers with Christmas tree-shaped ice cream slices, the way my grandparents did for Christmas Eve -- but I haven't forgotten them, either!